Organising fonts is a straight-forward task that can be greatly aided if you use the correct tool. 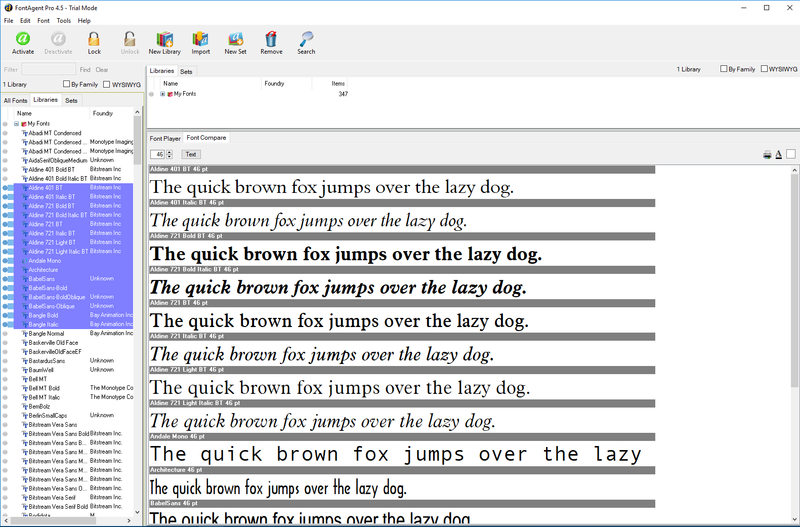 This article is a comprehensive survey of font managers for Windows 10, an operating system that historically has had less choice in this area than the Mac OS. The primary function of any font manager is to install and uninstall fonts from the system, and to view fonts whether installed or not. In order to make design decisions, we must compare samples of text in different faces. An ability to inspect the character sets (glyphs) and inspect font information (publisher, styles, tags) is therefore important. Support for TrueType fonts is essential, since this is the most popular format today. Support for OpenType fonts is also high on the list. Adobe PostScript (Type 1) files are less frequently encountered by home users. Since I organise files by folder on my drives, I need a manager that respects this existing heirarchy. It turns out that not all applications do. I also need to copy/move font files around the hard drive, for backup purposes, or simply to organise them. Most managers allow the creation of custom groups or collections of fonts, so that you can install them for specific clients, on a project by project basis, and so on. It is also helpful to be able to filter fonts by their characteristics, in order to narrow searches. 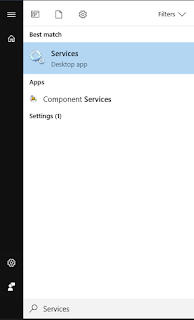 Be aware that for correct performance, a setting in Windows 10 needs changing. Before making this tweak, Nexusfont was deadly slow, X-Fonter wouldn't even launch, and other programs crashed unexpectedly. This is an essential fix. 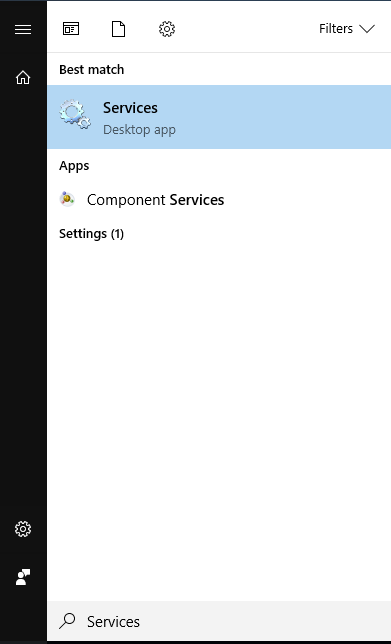 Click the Services Desktop app to run it. The right panel of this program lists services alphabetically (see below). Scroll down to "Windows Font Cache Service". Right-click this item and choose "Properties". Under "Startup type" choose "Disabled". Click "OK" and close the Services app. Job done! At $120 Suitcase Fusion 8 is the most expensive program in this review. A 15 day trial is available, but only if you register for an account. On launching the demo, you must sign in to run the program. Ah! The corporate world of yore! This font manager is targeted to professional design shops. As such, it integrates with networking facilities, cloud storage, and application platforms like Adobe's Creative Cloud. I was unable to evaluate these features, other than Google Font integration. All this did was enable viewing and selecting from the Google collection. There was no feature to generate any code you might need to use these fonts in a web browser or other program. I should back up a bit. On launching Suitcase Fusion, you are greeted with a cryptic decision concerning the Font Vault. Apparently, you can either "copy added fonts to the vault" or "Add fonts leaving them in place". I read this as a choice between copying or copying, so I chose the default. Someone really needs to work on their English! The main interface lists your Libraries, Google Fonts, System Fonts, and Smart Searches to the left, with a pretty display of selected fonts to the right. 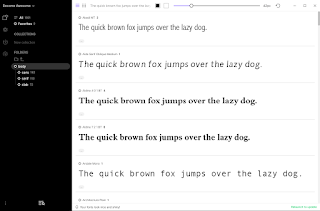 Four different previews are available, to aid in font comparison. Plus you can inspect the glyphs and font info (though for only one font at a time). I particularly like that fonts are grouped into their typefaces, while preserving all display information. Under Font Library you can create custom sets. But the only way I could add fonts here was to drag and drop them individually. Though you can tag fonts as Favourites, you can do nothing functional with this tag, that I could see. However, Smart Searches come to the rescue. One of these contains all your Favourites, so you can select all the fonts in this Smart Search and drag those to a Set. But to make a second set, you'd need to clear Favourites. This is not a great workflow. Adding fonts from a directory on disk requires selecting individual files (or groups of files). You cannot add by the directory itself, which is annoying. Once in the library, the directory structure is not preserved. There doesn't even seem to be a way to see where a font is stored on disk. Unsurprisingly, there are no file management features. I found the performance of this program unreasonably slow, something typical of Mac applications in general. Sometimes I'd click to Favourite a font two or three times before the darned star lit up yellow. Suitcase is a pretty program with few features compared to, say, Printer's Apprentice. The fact it completely hides folder structure eliminates it from contention for my use case. And the price is ridiculous for a simple utility. Insider FontAgent Pro is also designed for professional design teams, so it has server connectivity and plug-ins for Adobe Creative Cloud. It reads TrueType, OpenType, and Adobe PostScript files. The cost is $99 with a 30-day demo to evaluate. FontAgent has limited functionality. It doesn't directly view folders, but instead requires that files are read into Libraries. I could find no way to copy files from one Library to another, to filter the view, or perform any other useful organisation function. 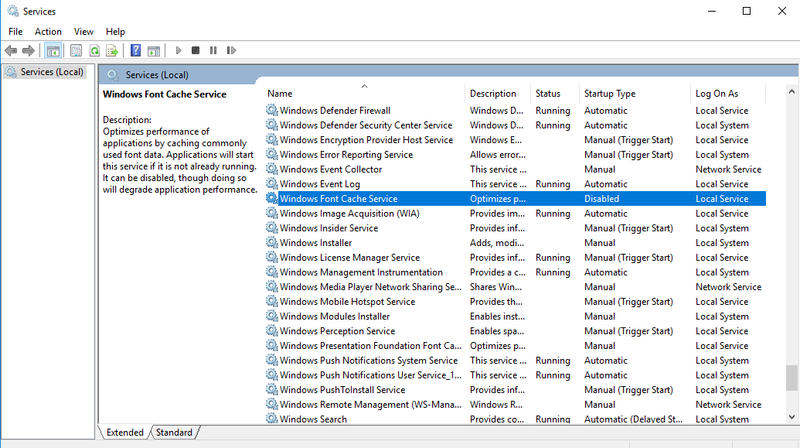 Nor is there a default way to view installed files; unless the same import process is run on the Windows folder. 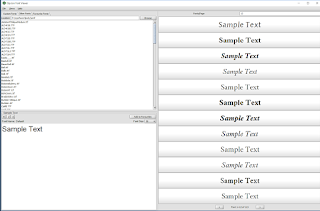 Fonts can be visually compared if you manually select them from the file list, but otherwise you see only the sample text. There is no way to view the glyphs or full file information. Most of the programs in this review deliver more features for less money. Naming your products with a calendar year was once all the rage. The disadvantage is that your product risks becoming dated. Proxima Software's FontExpert 2016 was last updated in December 2016, but is nonetheless a mature product, at version 14. You can use a trial version for 30-days, before purchasing for $59. The 64-bit program runs on Windows only. 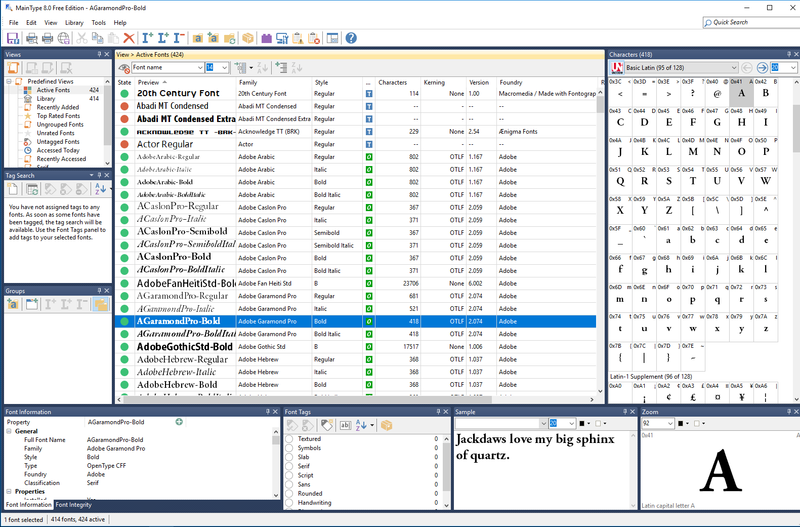 FontExpert can display the installed fonts, a folder from disk (using a hierarchical tree), filtered lists (according to data added, file type, etc. ), or a Worklist that you create. These are saved in standard XML format, but you can have only one loaded at a time. This is the first of several clunky implementations. The interface implements a panel view that is easy to customise. One oddity is that non-font files in a folder are displayed by default, though you can apply a filter to change this to a more common-sense setting. 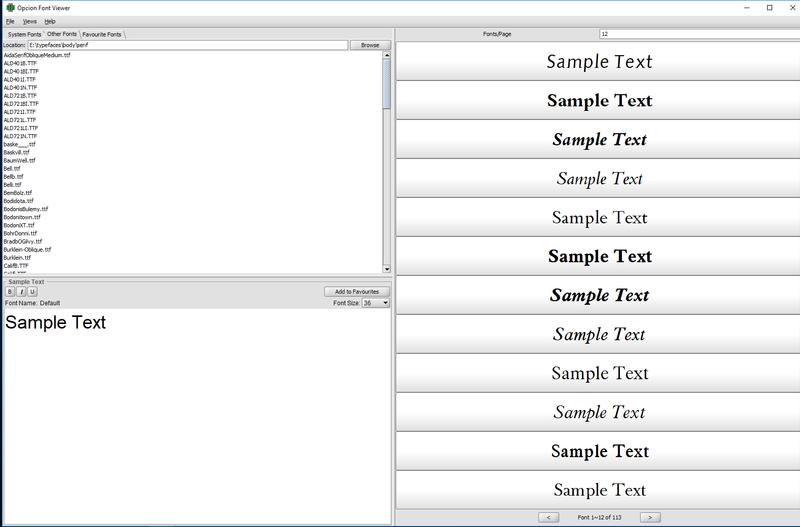 The Font Sample compares several fonts, with customisable display. The list of fonts is always taken from the file list, in consecutive alphabetical order. If you wish to compare a custom group of fonts, you would first creating a Worklist. This too is clunky. The program initially did a complete search of my drives and somehow found 8000 fonts, several times more than I actually have. Once added to the catalogue, there seemed no way to remove the spurious entities. The font install/uninstall process is odd. Not only are there two different ways to accomplish the same task, but these did not always appear to work. Sometimes an operation generated a warning that the computer needed to be rebooted. But after booting there was no change to the fonts. You can copy fonts directly from the panel and paste them in an Explorer folder. 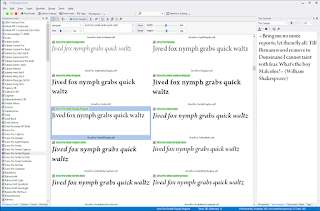 FontExpert supports TrueType, OpenType, and Adobe Postscript files. It is a competent program that has many less-than-ideal feature implementations. High-Logic MainType 7.0 is a 64-bit Windows program last updated March 2017. It is available in three versions. The free version supports up to 2500 fonts. The Standard Edition (€49) raises this limit to 10,000 and allows you to export fonts. The Professional Edition (€99) has no limit and adds custom views plus a registry fixer. Considering that none of the other products limit the fonts you can manage, this seems an odd way to segment a product. The interface is full of panels, each of which can be closed or rearranged. Furthermore, you can save particular views. This gives MainType the most customisable interface of any of these product. 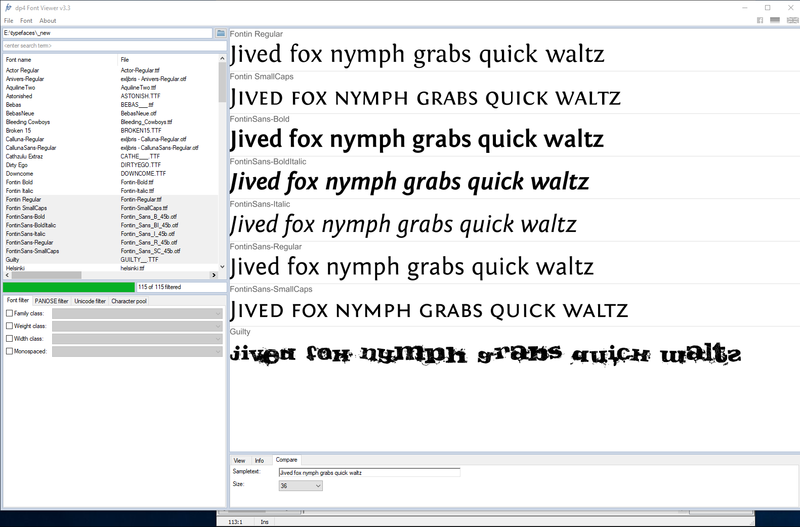 You can examine the glyph set, an individual character, sample text, and full font information. The main font list has 24 different columns you can display. Wow! MainType has its own approach to organising fonts. You cannot simply view folders on disk. But you can add a folder to the existing library, and if you are careful to check the correct options in the dialogue window, this will result in a new "group" that corresponds to the files on disk. It is even possible to keep this group in sync with the actual folder. But I can't help think that simply viewing the file folder is a much simpler method. Given the virtual approach, it's not surprising that there's no way to copy files. 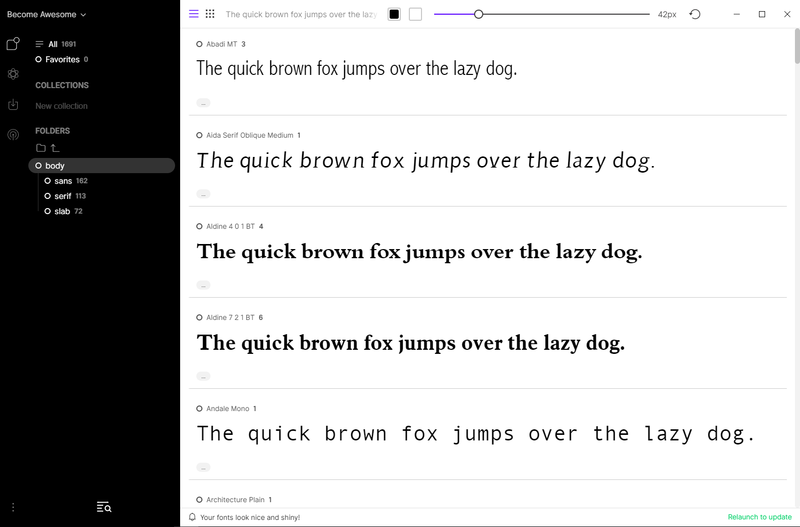 MainType supports TrueType, OpenType, and Adobe Postscript files. You can tag these for sorting in the main list. But besides its other limitations, MainType cannot compare fonts. It's impossible to recommend for that reason. David Bowie's final album was Blackstar and Peter Bowie's company is Blacksun Software. Coincidence? X-Fonter 10.0 is a shareware application with a nag on initial load. You can try it for 30 days before purchasing for $35 (currently $30). This Windows-only program was last updated in December 2017. You can view installed fonts, browse folders on disk, or view custom collections. A font will display as custom text, the glyph set, or font information. Like MainType, there seems to be no way to compare fonts, which is a major omission. Unique to this program is an image and effect studio that allows you to create drop shadows and other bitmap effects. These functions seem out of place in a font manager, being much better handled in a proper image editor. But no mind. You can automatically back up a font when uninstalling. Plus there are font registry tools, which I did not test. 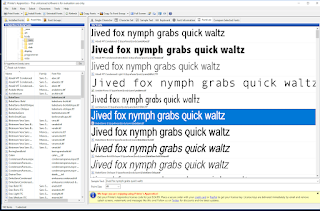 X-Fonter supports Truetype, Opentype, Adobe Postscript, raster, and vector formats. This is a more complete list than many products, so if your favourite tool is not reading a font file correctly, try X-Fonter. Printer's Apprentice 8.1 has been developed by Bryan Kinkel since 1991 (the days of Windows 3.1). The entertainingly-named Lose Your Mind Development has kept the application updated ever since, most recently in January 2017. It sells for $25 but has a shareware demo that runs for 30 days, complete with nag screens. You can choose to view installed fonts, font files, or font groups. A tree structure of your disk lists fonts in a panel below. 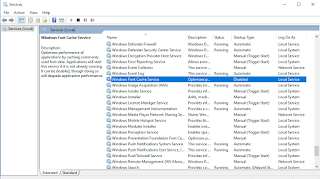 This familiar Windows Explorer-style interface can optionally include sub-folders, which is a useful touch. Font groups are used for organising your own collections. The right-hand panel has many views: sample text, a single glyph, the full character set, font information, and so on. You can easily install/uninstall fonts. Font files can be automatically backed up when uninstalled. Registry errors can be fixed. You can print catalogues and sample sheets of your fonts (a function that used to be quite important). There are numerous other functions, including the ability to copy files on disk. 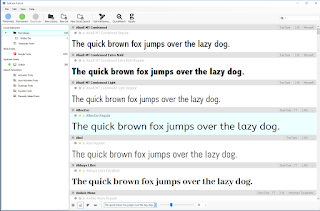 Printer's Apprentice supports TrueType, OpenType, and Adobe Postscript Type 1 fonts. Despite the retro look and feel, it is perhaps the most feature-rich programme in this review. 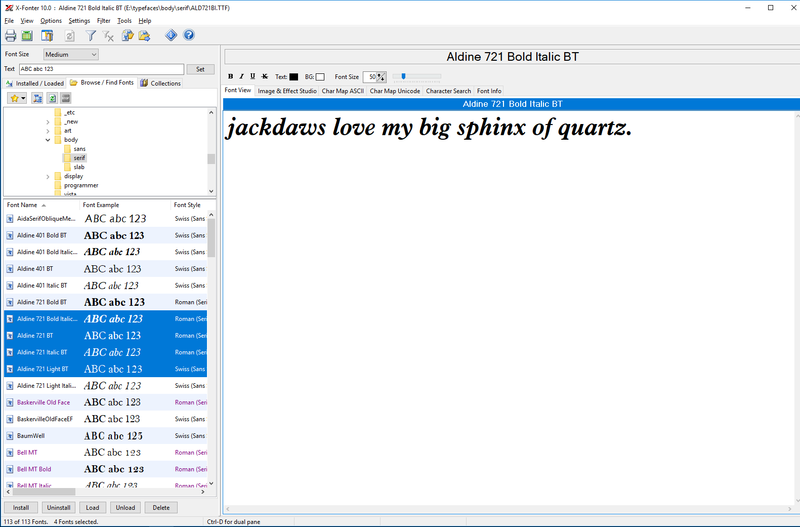 The Font Thing is a fossil, a program written in Borland's development tool Delphi 4 and designed for Windows 95. Though last updated in 1999, it works just fine on Windows 10. This is a testament to the backwards-compatibility of the operating system, and also to how little the requirements of a font management have really changed. Sue Fisher should be commended on her coding, which has resulted in a portable application (no installation needed) of trivial size. This program implements the nested Windows interface that looks quaint rather than offensive. We can view either installed fonts, customised collections, or folders on disk (using a folder tree). Below this panel is a listing of individual font files. To the right we can view the glyph set, sample text, or font info. We can also view multiple fonts at a time, though this list does not synchronise with the file list to the left. The toolbar or context menu (right-click a font) makes it trivial to install, uninstall, print, view, or otherwise manipulate the font. We can copy and paste between directories on disk, or add fonts to our own collections for ease of management. 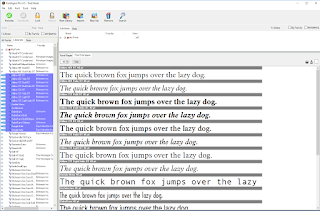 This program is entirely free and, unlike others under consideration, contains all the functionality required of a font manager. The major limitation is that The Font Thing reads only TrueType fonts. 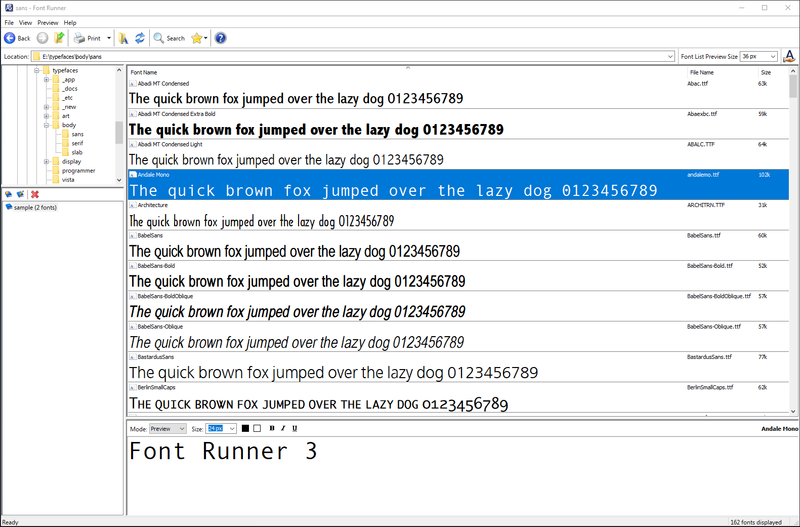 Font Runner was developed as an in-house project by John Famiglietti in 2000. It was last updated in April 2013 to version 3.2.4. This program read files from a directory tree and adds them to custom Projects. You can view sample text but not the file information or glyph map. You can install a font but not uninstall it; nor is there any way of telling if the font is already installed. This programme in no way meets minimal requirements but was included in this review for completeness. Opcion is the product of Paul Chiu, a developer based in Brisbane. It was first released in 2004 and last updated in August 2007. The program uses the Java Runtime Environment and hence supports Windows, Mac, Solaris, and Linux operating systems. That is unique coverage among the tools in this review. Opcion allows you to view system fonts, font files in a given folder, or those tagged as favourites. But it has no cataloguing system as such, and doesn't even remember the last folder you viewed. This makes the process of navigating a drive tedious. The program cannot manage backups or file transfers. Furthermore, the synchronisation of the font list and viewer is wonky. It has no other features, not even the ability to install a font. This application could politely be described as past its best-before date. Despite this, the Sourceforge page says it has had 48 downloads this week. 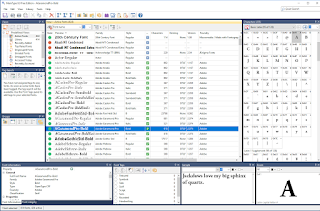 dp4 Font Viewer 3.3 is a Windows-only program developed by Stephan Deutsch in Germany. The 64-bit executable doesn't need installing, and so is completely portable. 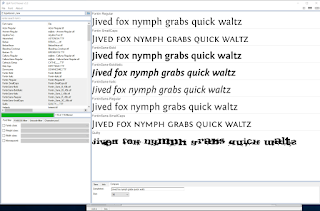 This minimal program supports TrueType and OpenType fonts. The UI can switch between German and English. The program works on the basis of file folders only, displaying all files in a folder, including sub-folders (whether you wish this or not). Multiple fonts can be compared by simply selecting the names. This works well for a few files in close alphabetical proximity, but isn't efficient in a long list. Glyphs and font info can be displayed. 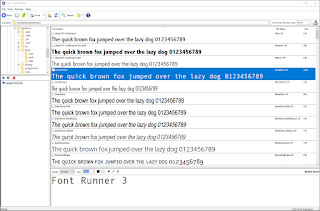 Fonts can be filtered on various characteristics embedded in the font info. For example, you can view only "transitional serifs" or "modern serifs". You can look for all fonts that contain a given character, and so on. However, there is no way to tag files with custom attributes, and no way to create your own sets or collections. There are much better choices than dp4 Font Viewer. 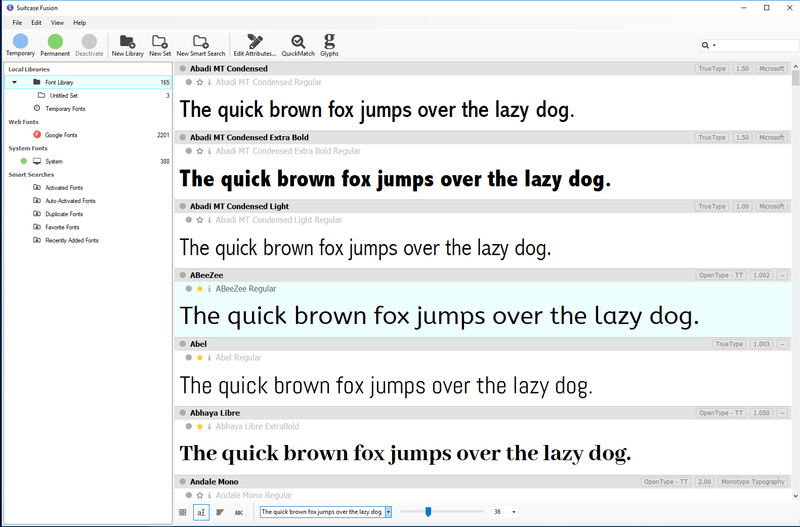 Fontbase is a slick modern program for Mac, Windows, and Linux that supports TrueType and OpenType files. It's designed by Dominik Levitsky, but the blog is empty and there is little other information on the Web 2.0 styled site. Nonetheless, it was updated as recently as December 2017. The flat interface conveys almost no information. For example, it is possible to activate, pin, or favourite a font. What do these functions do? How are they different? There's no telling. Likewise, the function of any icons must be determined by trial and error. Several do nothing at this time. Conveniently, you can drag-and-drop folders directly from a file explorer to the interface. This preserves the structure, but in place of a recursive tree structure, you view only a single branch at a time. 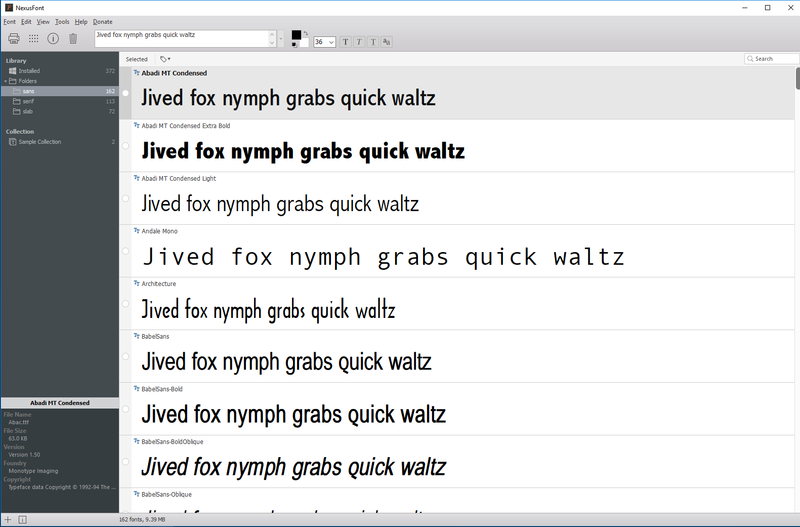 Like Suitcase Fusion, Fontbase displays fonts grouped by typeface. But unlike Suitcase, you must click a face to open a new view in which to see the variants. In other aspects, too, the interface is surprisingly modal. It has all the annoying limitations of a mobile phone app. You can view glyphs but not font info. 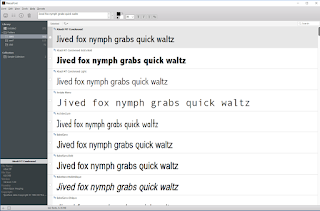 Like Suitcase, you can view Google's online font collection. That's about it for features. Fontbase is a sketch of future promise rather than something to use today. It seems entirely designed to drum up money by way of subscription. Apparently, this is called being "Awesome". We are treated to a full-screen display of this attitude when the program launches. After clicking through the hard sell, helpful text in the status bar announces "Your fonts look nice and shiny!" I believe the culturally-appropriate response is: "Gag me with a spoon." Nexusfont is a Windows program written by JungHoon Noh of Seoul. 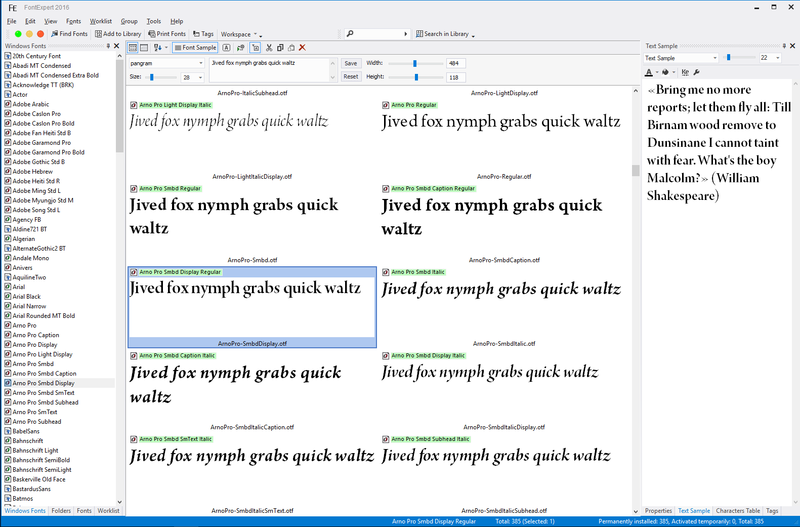 Last updated in November 2015, this slick programme supports TrueType and OpenType files. Fonts are organised under two headings: Library and Collection. Initially, the Library has one category that displays your installed fonts. You get a neat list of fonts, each displaying the name, sample text (which you can customise), and file type. There's a compact information panel. You can view all glyphs (the "charmap") in a popup window. Under "Library" you can create new "folder groups" and within these your actual folders. Unfortunately, if you add a directory on your hard drive that already has subdirectories, this structure is not preserved. Hence it is best to import each folder individually, which could be tedious if you have many of them. Besides the Library structure, you can add fonts to custom Collections. Furthermore, you can tag fonts and select from the file list using these attributes. Any font (or group) can be installed/uninstalled, copied, and so forth. This is flexible and usable. Though pleasant to view, the interface could do with a rewrite for functionality. The character map, font information, tags, etc, appear only as popup (modal) windows. It would be much more convenient if these were configurable panels on the main screen, in the manner of MainType and FontExpert. Nonetheless, Nexusfont has every function I need, looks good while doing it, and is completely free. It is notable for being available in two dozen languages, the only program here to be truly international. The following table summarises the file types and price of each program. Key: T=TrueType, O=OpenType, A=Adobe Postscript, g=google, r=raster, v=vector. "You get what you pay" for is an old saying that is rarely correct. In the world of font managers, some of the most expensive programs are the least fit for purpose (FontAgent, FontExpert 2016). Meanwhile, some of the free ones work perfectly well. For my purposes I choose Nexusfont. It's free, capable, beautiful, and internationalised. Unlike The Font Thing, it supports OpenType. If I also required support for Adobe Postscript files, I would pay the meager $25 for Printer's Apprentice, and reap the benefits of its many features. Compared to these two programs, its hard to see any advantage in the competition. Thanks you for these review and testing all these programs. I won't complain, because of all these programs, this is by far the best. However I have to admit, I had an old license of MainType. It was not a bad program. Didn't try the newest version trough.